LocalCoinSwap is holding a crowdsale event of LCS Cryptoshares. Cryptoshares are a digital asset which will be used to facilitate distribution of all profits made by the LocalCoinSwap platform, in addition to all profits made by new business ventures under the LocalCoinSwap umbrella. Cryptoshare holders will additionally receive airdrops of new ICO tokens listed on the LocalCoinSwap platform. The platform implements a novel approach to traditional company ownership by utilising blockchain technology to distribute the entirety of the site’s profits to holders of LCS Cryptoshares. This asset entitles investors to regular dividend payments denominated in all of the currencies traded on the platform. 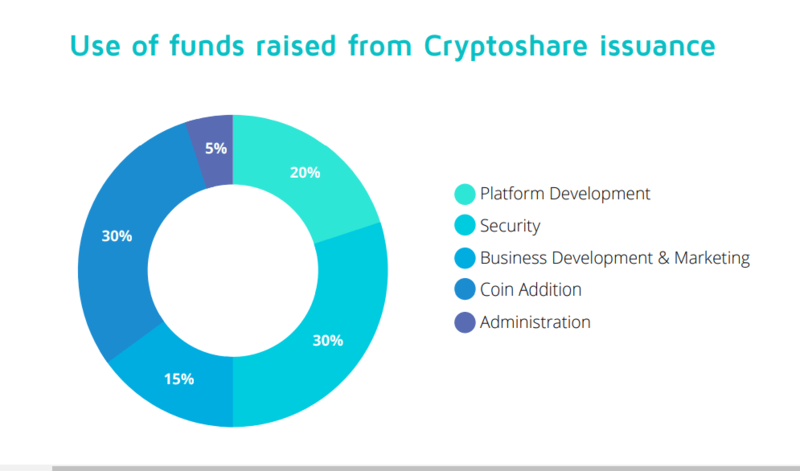 Holders of the Cryptoshare may also participate in the long run vision and decision making of the company itself through democratic voting in a proofof-stake system. This replicates the dividend payments and shareholder voting of traditional companies, with the added benefits of blockchain technology and decentralisation. Funds raised from this crowdsale event will be used to expand and speed up the development of the LocalCoinSwap platform and increase the number of cryptocurrencies which the platform is able to support on release. Centralised cryptocurrency exchanges in their current form are fraught with inefficiencies, security risks, long wait times and unreasonable verification requirements. This results in high barriers to entry for a huge number of potential users. Commonplace also are unethical business practices including insider trading, front running, and deceptive pricing. As long as these problems exist, there will always be a demand for P2P marketplaces. P2P marketplaces provide direct access between buyers and sellers, which represents the truest form of free market trading. The future of the digital currency ecosystem relies on the development of a robust P2P exchange which supports a diverse choice of cryptocurrencies. The innovative distributed ownership model offered by LCS Cryptoshares will bridge this gap in the market, while delivering the profits of the platform back into the hands of its users. In addition, LocalCoinSwap will be the catalyst for expansion of the cryptocurrency market by enabling new users through the elimination of all barriers to entry. Cryptocurrencies and other digital assets are revolutionising the financial ecosystem. In 2017 alone the market capitalizations of all digital currencies grew by 3171% to 700 billion ($700,000,000,000) USD (source: coinmarketcap.com) . Unfortunately the growth of the cryptocurrency economy has been fraught with friction from the banking system. Hostile regulatory environments and conservative institutions have closed the accounts of traders and exchanges en-masse, spread contention in the media, and forced the implementation of onerous verification procedures which have transgressed the privacy of the community. The rise of cryptocurrencies has created huge economic and investment opportunities. However, many people remain on the sidelines due to lack of patience or tech-savviness, inefficient and lengthy subscription processes, and security concerns. Opening up trading accounts on exchanges can be an especially difficult task for users. Many exchanges restrict the registration of new accounts or require users to expose themselves to identity fraud and theft by submitting pictures of their passports and personal documents online. Users are regularly asked to transfer funds overseas to companies in countries with no legal oversight. Existing P2P markets are also highly fragmented and non-inclusive. Traders who wish to buy and sell outside the top few cryptocurrencies must access both a P2P exchange and a centralised mainstream exchange. At present there lacks a single mainstream P2P marketplace which allows more than one cryptocurrency to be traded for fiat currency simultaneously. This has created additional onerous fees for users whose only desire is to purchase a nonmainstream cryptocurrency with fiat cash as their starting point, as they must utilise more than one exchange and pay all associated fees to complete their purchase. They must also pay the transaction fees involved in withdrawal from one marketplace to another. This increases not only user inconvenience and wallet software requirements, but also user exposure to platform failure or hacking. The digital ecosystem is here to stay, and the mainstream economy is beginning to embrace the ideas of decentralisation and unrestricted trade. 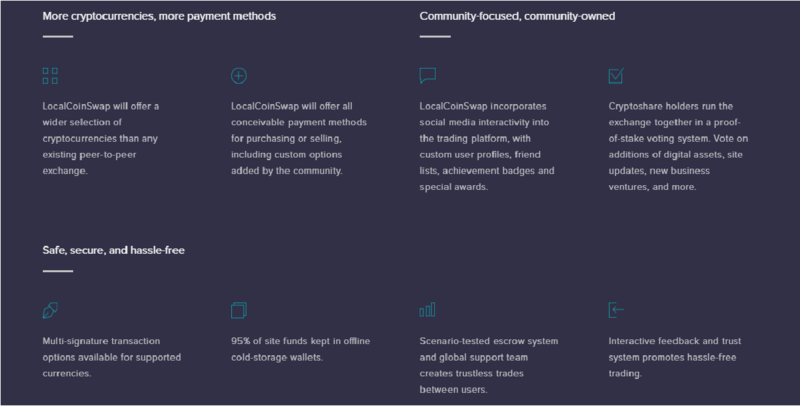 LocalCoinSwap represents a return to the most fundamental system of asset exchange without reliance on mainstream institutions – the P2P trade. By enabling P2P trading of all digital currencies LocalCoinSwap will put the market back into the hands of its users, allowing them to directly trade any cryptocurrency using any conceivable payment method in any geographical location. There is currently a gap in the cryptocurrency market creating an unserviced demand. Across community forums and social media sites in which traders participate, it is a common frustration that users are unable to quickly or easily purchase non-mainstream cryptocurrencies. Users also express repeated concerns about overseas banking transfers and onerous verification procedures. The LocalCoinSwap infrastructure will close this gap in the market, not only by offering a P2P exchange for all cryptocurrencies, but by also tokenizing ownership of the exchange itself into the hands of its users through the world-first Cryptoshare system. The LCS Cryptoshare system utilises blockchain technology to replicate traditional company ownership through shares in a more secure and decentralised manner. Much like the issuance of regular shares and profits distributed through dividends, LocalCoinSwap issues Cryptoshares which entitle holders to regular redeemable dividend tokens. Unlike a traditional financial organization the ownership and dividend structure of LocalCoinSwap is hosted entirely on the Blockchain, providing a publicly auditable and unforgeable ledger of the company’s financial performance. LCS Cryptoshares allow all traders on the exchange to take ownership in the platform they are trading on. LCS Cryptoshares are not like traditional ICO tokens. Instead of a vague promise of possible future returns or idealistic visions which may never eventuate into product, Cryptoshares entitle the holders to guaranteed rights to 100% of the total profits from the Localcoinswap exchange through cryptocurrency dividends. Cryptocurrency profits are paid to shareholders in the same cryptocurrencies in which they are made, allowing the investor to receive a regular stream of portfolio income. By holding a single Cryptoshare asset, the investor is entitled to a wide variety of cryptocurrency profits across the entire spectrum of the digital economy. Cryptoshare holders are also entitled to receive airdrops of new tokens when ICO’s are listed on the LocalCoinSwap platform. In addition, LCS Cryptoshares entitle the holder to voting rights in the platform’s decisionmaking process, such as the listing of new tokens on the exchange, the direction of new business ventures and design considerations or functionalities for the platform. 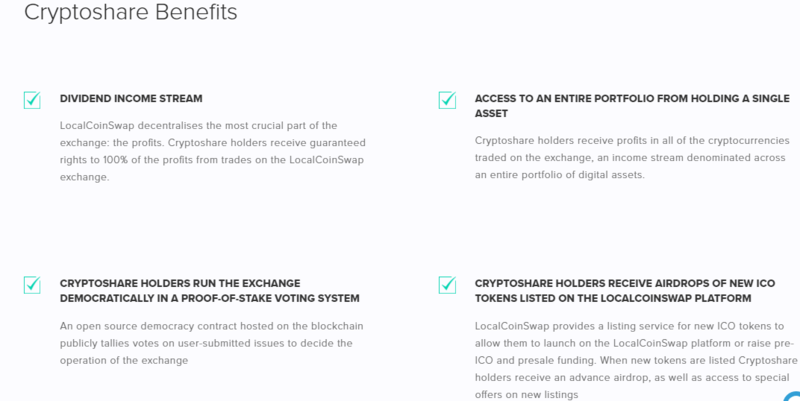 Cryptoshares in LocalCoinSwap are more than just a stream of dividends, by investing you become an integral part of the future of the exchange itself. The protocol behind the LCS Cryptoshare, dividend distribution and voting token is provably achievable with existing technology and does not require any fundamental advances in Blockchain technology to implement. The development focus of the Cryptoshare is on the direct utility it provides for the user rather than aiming to be disruptive technology. At the end of each financial period, profits for all cryptocurrencies are calculated and published publicly before being distributed back to LCS Cryptoshare holders. A dashboard is available on the LocalCoinSwap platform detailing the dates, amounts and distribution details for the current period. To claim dividends such as ETH, BTC, BCH, DASH, ETC, or Monero, the holders of LCS Cryptoshares are automatically entitled to claim ERC20 dividend tokens on a 1-to-1 basis according to their holdings of Cryptoshares. After claiming the dividend tokens, holders can use the token to sign a message containing their wallet addresses for the currencies they wish to claim. They then broadcast the message and dividend tokens back to LocalCoinSwap’s decentralised contract address, at which point the dividend currencies are transmitted automatically to their respective wallets. Alternatively, the dividend tokens can be redeemed directly into the wallet balances of user accounts on the LocalCoinSwap platform. Because of this, there is no obligation to redeem the cryptocurrency portfolio income into the private wallets of LCS holders, and users may instead hold on to their dividend tokens, choose to redeem their funds at a later date, or even liquidate the token through an off-market sale. 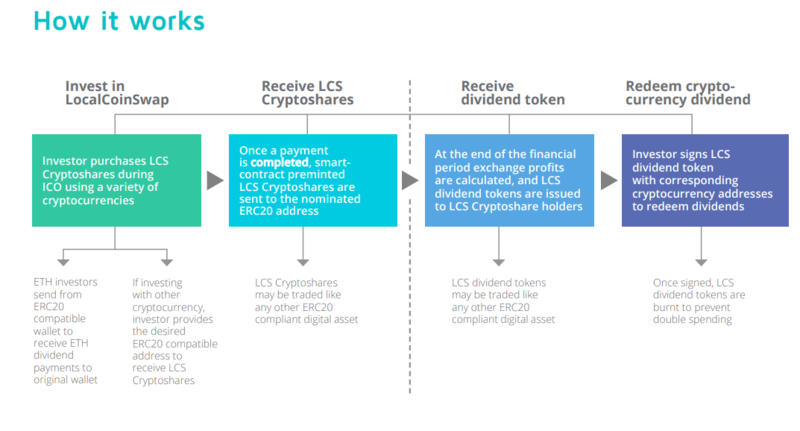 LCS dividend tokens can thus act as a placeholder for an entire cryptocurrency portfolio, without forcing the user to deal with the process of setting up multiple cryptocurrency wallets. PrelCO Official white paper launch.